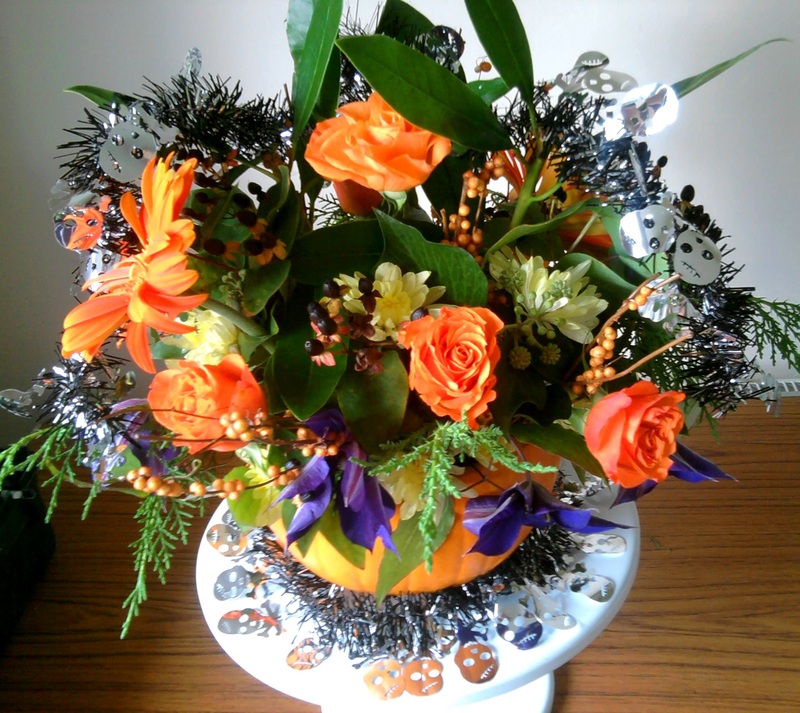 In the first of our weekly ‘How to’ feature, we’re going to show you how to make a stunning centrepiece for your Halloween festivities, perfect for parties that the grown-ups will be wowed by too. You’ll find everything you from the supermarket, local street market or hobby craft store. We even picked our own foliage and berries from the garden and woods – it’s amazing what you can find when you start looking! 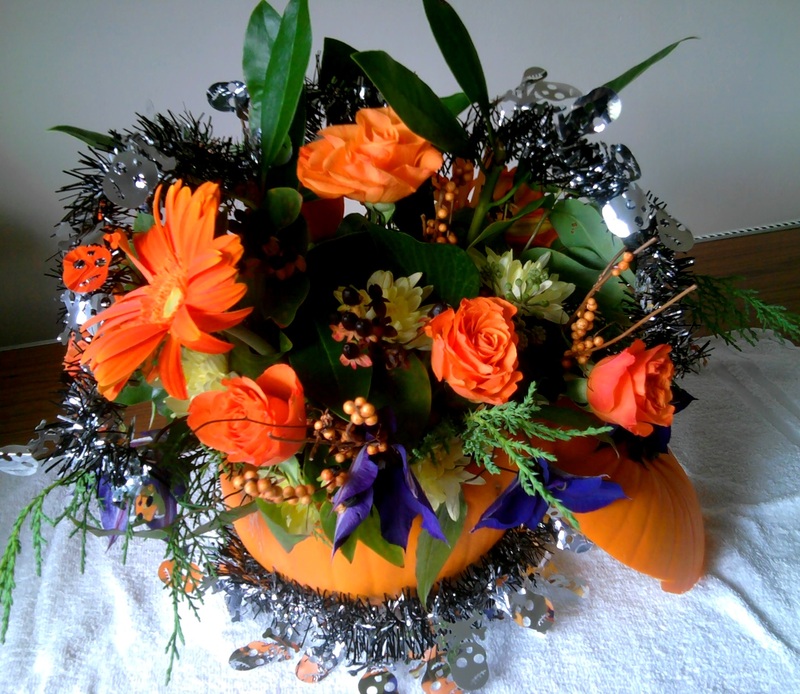 A pumpkin – any size is fine but the bigger it is, the more flowers you’ll need. 7 bright orange roses. Choose flowers that have bloomed, rather than tight buds. Cut the top off your pumpkin and keep the ‘lid’. Remove the seeds and discard. Scoop out the flesh using a sharp knife and large spoon. A good idea to keep this in a bowl and use for pumpkin soup (really simple to make and yummy!) or pumpkin pie if you’re feeling more adventurous. Line the inside of the pumpkin with a doubled piece of clingfilm. 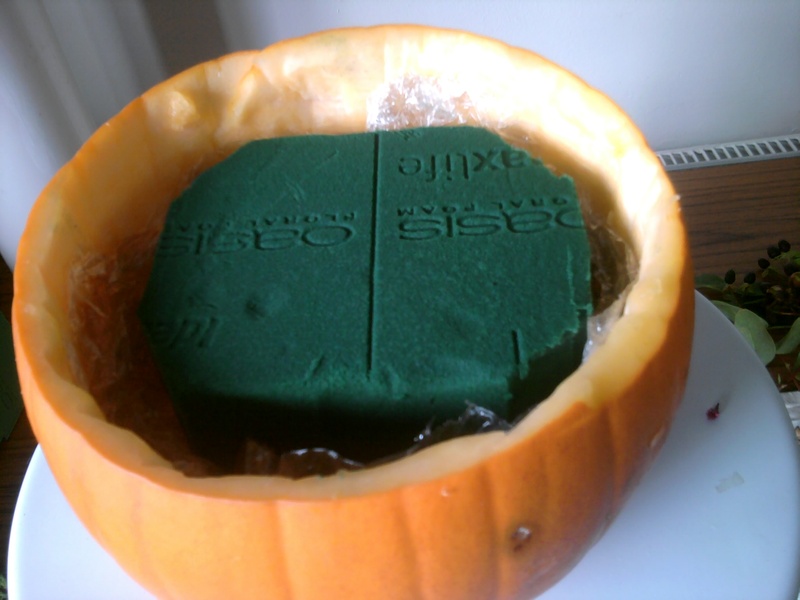 Insert a soaked piece of oasis to fit securely in the pumpkin and to reach just under the top. Take the pieces of spikey foliage, remove the greenery from the bottom part of the stem and cut to a point. Insert into the oasis to make the outline of your arrangement, remembering to work all the way round the arrangement. Add two larger-leafed pieces to the side-middle. You now have the basis of your arrangement. Now take your 7 orange roses. These will be the main feature of the arrangement. Place the first one in the middle so that it is a little shorter than the middle leaves. Work around the arrangement evenly pacing the roses. Add your 2 orange gerberas (or large chrysanthemums) one each side of the centre, one towards front and the other towards back of the arrangement. 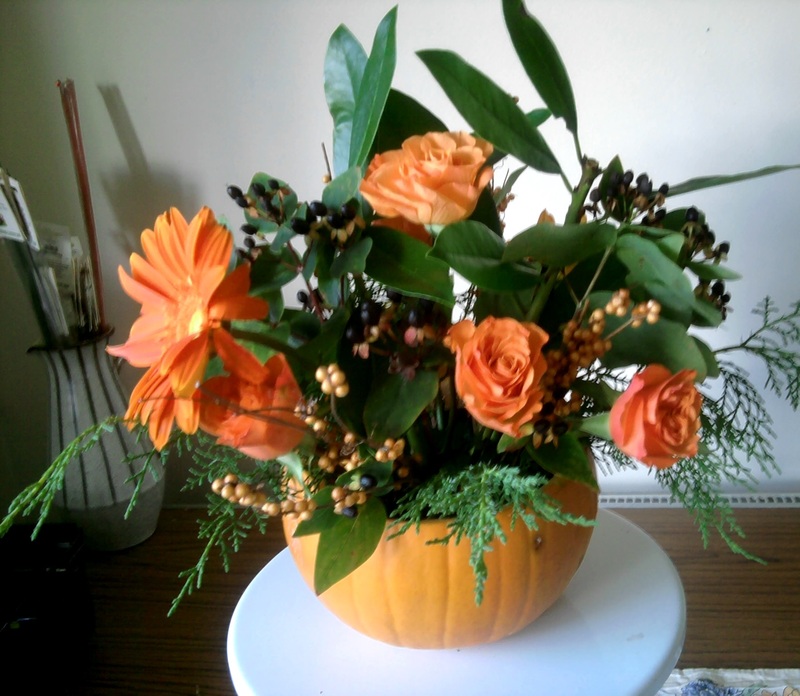 Add black hypericum berries and orange dried berries evenly amongst the flowers and foliage all around the arrangement. Now for some purple! Take several clematis flower heads (or other purple flowers (lisianthus or asters can be found in purple) and place them around the lower part of the arrangement. Continue to add more small pieces of foliage where you see spaces. If you can pick some berried ivy, which seems plentiful on the wild ivy this year, it will create excellent contrast. Lastly, add some pale yellow spray chrysanths to ‘lift’ your arrangement as orange, purple and black are intense colours. Place the chrysanths further into the oasis to create depth in your arrangement. If you can still see the oasis use more foliage to fill in. Optionally you can sprinkle on a handful of Halloween magic with some spooky accessories such as spiders, bats or ghouls. I showered mine with witches dust (silver glitter) and finished off with a string of skull and crossbones tinsel. Place the lid of the pumpkin on the side for a final florish. Of course, if you’re up to your fangs in treats and apple bobbing you could always contact us for some help on 07922 422 416 or 07922 422 616.